The Breakdown: How Can the Fed Help the Economy? In a major speech last month, Federal Reserve Chairman Ben Bernanke pledged to buy more longer-term securities if the economy continues to worsen. But will this benefit really trickle down to individuals? In a major speech last month, Federal Reserve Chairman Ben Bernanke pledged to buy more longer-term securities if the economy continues to worsen. But how exactly will that boost the economy? And will this benefit somehow trickle down to individuals? 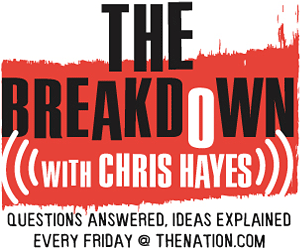 Nation DC Editor Chris Hayes and Washington Post economic writer Neil Irwin answer these questions and more on this week's edition of The Breakdown. In a major speech last month, Federal Reserve Chairman Ben Bernanke pledged to buy more longer-term securities if the economy continues to worsen. But how exactly will that boost the economy? And will this benefit somehow trickle down to individuals? And given the fact that interest rates are already very low, what can the Fed do to stimulate the economy beyond further cutting these rates? The Nation‘s DC Editor Chris Hayes and Washington Post economic writer Neil Irwin answer these questions and more on this week’s edition of The Breakdown. The Washington Post‘s economics blog Political Economy. The full text of Bernanke’s speech.